Imagine in the air, above your outstretched hands, there is a flurry of juggling pins—orange for work, green for children, blue for relationships, yellow for household, and more. Can you keep all the pins in the air? Can you put one down momentarily? 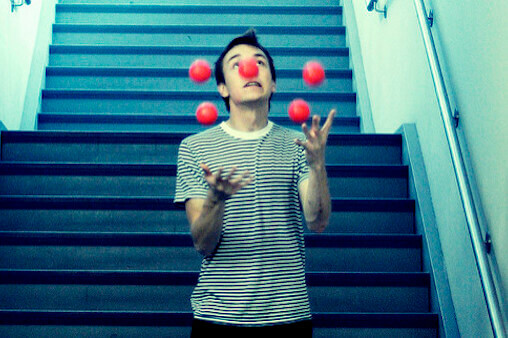 In the best of circumstances, parents may feel they are juggling too much. When a health crisis occurs, even a smoothly functioning family system can become overwhelmed by an added red pin. Other pins may be dropped. Imagine this: your eight year old is hospitalized for cancer treatment; your partner is away on a business trip; your three year old is having tantrums daily; and you need to prepare for work tomorrow. Particulars vary by family, but a similar overload occurs in most families journeying through serious pediatric illness. The challenge is exacerbated for single parents and for families in poverty. Many parents rely on multi-tasking, perhaps cooking supper while coaching a child on homework or making phone calls while watching a child’s athletic practice. The day is both too short and too long. When a child is diagnosed with a significant illness, daily life can become a seemingly impossible juggling act. Parents simultaneously face challenges of keeping their own emotional balance, securing the best treatment for their child, meeting the needs of healthy and ill children, addressing financial constraints, and ensuring ongoing family functioning. With the primary focus on a catastrophically ill child, care for young healthy siblings—needing constant affection, guidance, and protection—may become particularly difficult. Developmentally egocentric and cognitively immature, preschool children may react with a mix of emotions and behaviors when a brother or sister is very ill. They cannot fully understand what is going on, express their emotions verbally, or think beyond the present. They want attention, reassurance, affection, and favorite foods—right now! Unable yet to take another’s perspective, they may blame themselves for a sibling’s sickness, fear they too will become ill, and not comprehend their sibling’s unique needs. They may be jealous of extra attention the ill child receives. As a family weathers pediatric illness, young children are continuing their physical, cognitive, and emotional development, but some temporary regression may occur even for a healthy child, perhaps in toilet training or separation anxiety. Over time, they will learn to understand the situation better, become more able to delay immediate gratification, and find words to express their feelings. Fortunately, with ingenuity and the support of a larger circle of caregivers, most families can maintain core elements of family strength—love, structure, guidance, honesty—albeit in a different configuration. No one parents perfectly, especially in times of increased stress. Being attuned to what really matters in family life is far more important than a tidy house, fashionable outfits, gourmet meals, volunteering for everything, or enrolling children in every opportunity available. 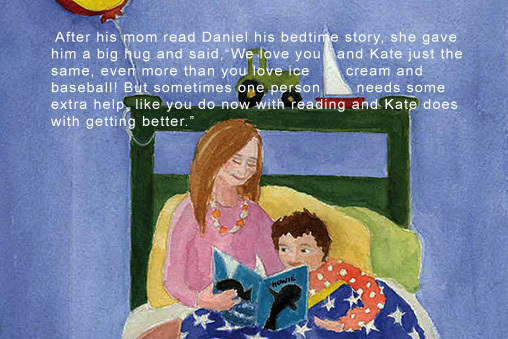 Friends can lovingly coach parents to take care of themselves, bringing respite and renewal. Trusted caregivers, including grandparents, aunts, uncles, neighbors, and friends, can help a child by reading stories, going on walks, preparing and serving meals, giving a bath, playing, and reassuring. Pediatric professionals such as Child Life Specialists can provide a guiding hand to parents to assist all of their children. Parents need to show their love continually for each of their children, emphasizing quality and predictability, particularly if time is precious. With the very young, simply snuggling, playing, and voicing love are powerful. Even if parents need to stay in the hospital overnight with a sick child, they can remain “present” at home in innovative ways. Pre-taping a favorite bedtime story or loaning the child a familiar personal object (such as a shirt) may help soothe a younger sibling. Daily phone calls and online video contact (Skype or FaceTime) can become a new ritual. A consistent family structure—including meal, nap, play, and bedtime rituals—provides a sense of security to children. Disrupted by medical appointments, increased physical care-giving for the ill child, even financial considerations, the pattern of daily life will likely need to be adapted. Sharing changes ahead and keeping the time schedule as predictable as possible will support the family pattern. For example, nap-time can remain at the same hour, but an uncle or neighbor may become the caregiver. Keeping key elements steady while letting go of being a “perfect” parent will ease the burden. When young children have intense emotional and physical outbursts, It is important to maintain consistent behavioral expectations as well as express understanding around their feelings. Reasonable family rules and consequences for behavior help children feel safe, and empathy helps them feel heard and accepted. Even when children try to soothe upset parents, adults need to stay in the parental role as far as possible. At the same time, for parents, allowing room for their own tears, fears, exhaustion, and uncertainty is an integral part of the role, not evidence of poor parenting. Adults are often tempted to protect their children from the truth of a difficult diagnosis and prognosis by withholding information. They may fear they will upset their children more or not know what to say. Yet children are almost barometric, picking up on emotional tension in parents’ voices and body language. They may know something is wrong, yet fantasize a situation worse than exists. Professionals can help parents find the best words to use. Acknowledging a child’s condition and answering their questions honestly, in age appropriate ways, are essential. By ensuring that the emotional and physical needs of their healthy young children are met as well as those of the ill child, parents will protect the family’s strength and stability. How parents handle a medical crisis can set a positive example for their children of connection, resilience, and flexibility, which will assist them in the future when they too will confront tough challenges. Deciding which pins to keep aloft, which to put down temporarily, and which to let others juggle, is key! 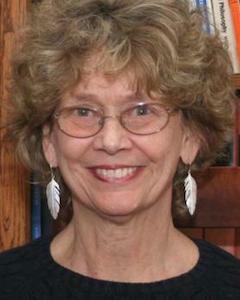 Sally is a professional artist, cancer survivor, and retired clinical child psychologist. She is the author of Daniel and His Starry Night Blanket: A Story of Illness and Sibling Love and Rad Art: A Journey Through Radiation Treatment. You can find more from Sally at SallyLoughridge.com. Please join her on her Facebook author page and on her Facebook studio page.